An upcoming tweak called FacePane from developer Andrew Wiik will allow iOS users to talk to their friends on a Facetime video call from anywhere on iOS. The tweak will show the video call pane on the screen where you will be able to see the call in action while being able to use any app you like. 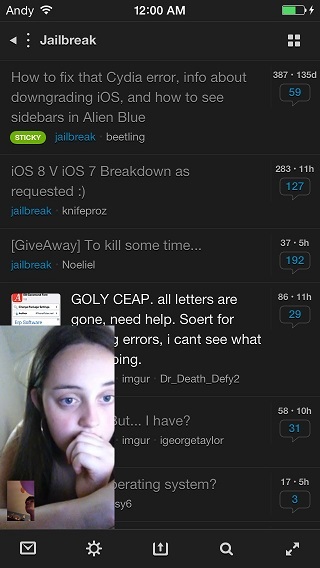 The FacePane tweak makes the experience of using Facetime a lot more powerful than it already is. Normally, when you press the home button to perform other task during a Facetime call, the video call is ‘Paused’ for the person on the other end who can only listen to what you are saying. You on the other hand are not able to see the video feed of the person you are talking to, instead there’s a green bar on top of the screen indicating the call is still in progress. That changes with Facepane tweak as the video call will continue as normal while you reply to an SMS, read an email, check your Twitter timeline or whatever you like to do. The tweak comes with a number of great features that include ability for users to end a call by swiping, resize and reposition the video pane and switching cameras by double tapping. Users will also be able to mute or un-mute the call by performing long and short hold on the pane respectively. FacePane is not available in Cydia right now but it will be launching soon. The tweak will be launched as a free download, which is always great. Its tweaks like FacePane that remind us why we jailbreak our devices. Such hacks allow us to take advantage of the full potential of our iPhones and iPads. I can imagine how this tweak would be even more useful and fun to use on an iPhone 6 or iPhone 6 Plus once jailbreak for them has been released, as both devices have larger screens and offer more real estate.